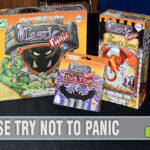 After seeing the first three entries into our series about games to play at Halloween, you might be thinking, “I don’t have the time to play a game AND hand out candy at the same time!”. We realize that candy-giving has priority on this holiday and depending on the neighborhood and the quality of the candy you’re providing, you might be answering the doorbell a LOT more than someone passing out raisins on a rural highway. 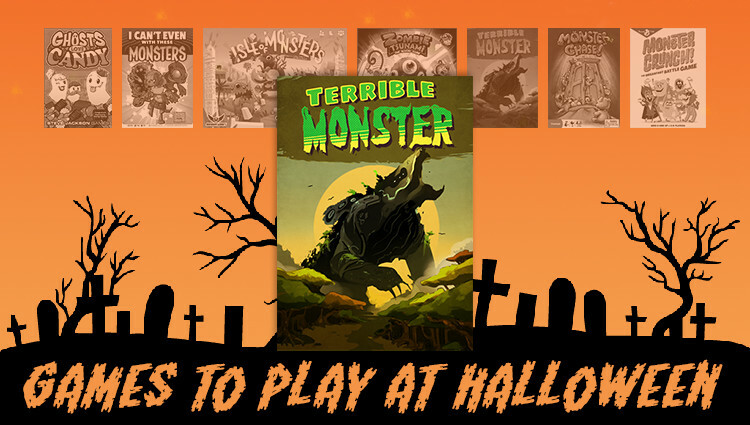 Terrible Monster by Sweet Lemon Publishing might just be the solution you’re looking for. 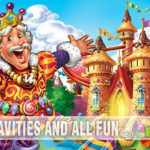 Designed specifically for two players and each game lasting only around ten minutes, you could probably play an entire hand between costumed visitors! 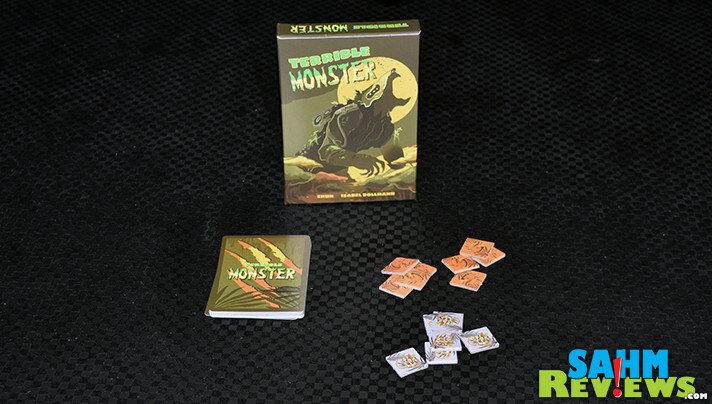 The entire game of Terrible Monster is comprised of only sixteen cards and fourteen tokens. Each player begins the game with five randomly-dealt cards, four Life tokens, two Counter tokens and a reference sheet. The rest of the deck of cards are placed into the center of the playing area within reach of everyone. 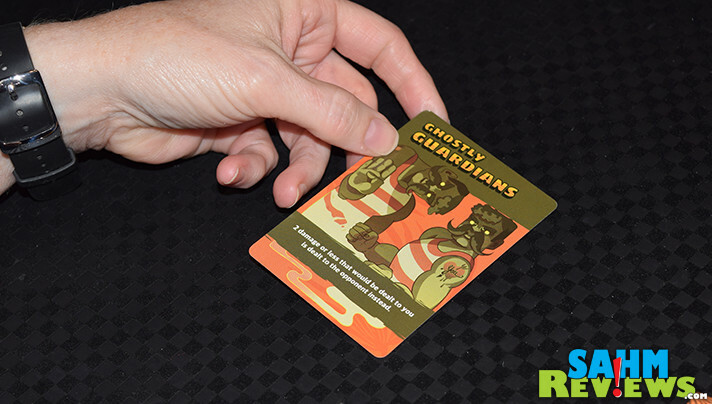 The goal of Terrible Monster is to rid the other player of all of their Life tokens before they do the same to you. 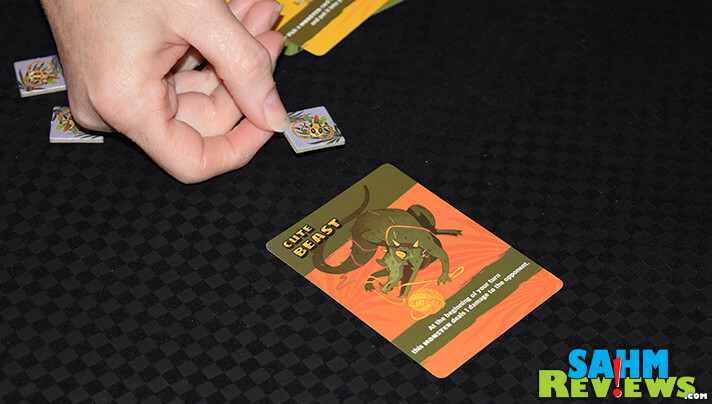 The starting player (determined randomly) plays up to one card from their hand and resolves it. 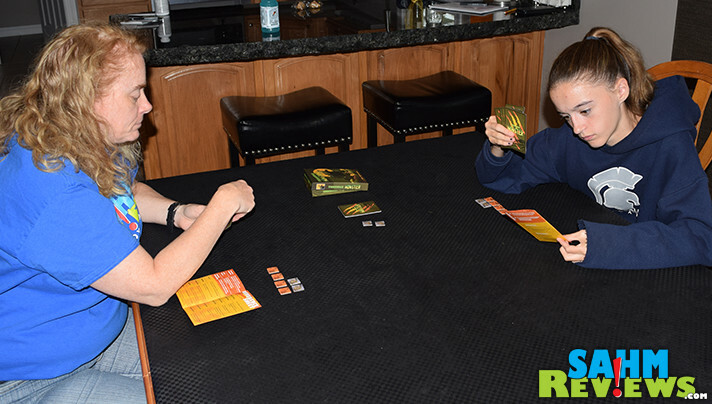 On following turns, the active player will draw one card from the deck at the start of their turn and play up to two cards from their hand, resolving both. Played cards take immediate effect unless the opponent uses one of their Counter tokens to nullify its effects. If not countered, monsters are put into play in front of you while spells are cast immediately. After resolving, all cards (countered or not, with the exception of monsters) are put into the discard pile as are any used tokens. 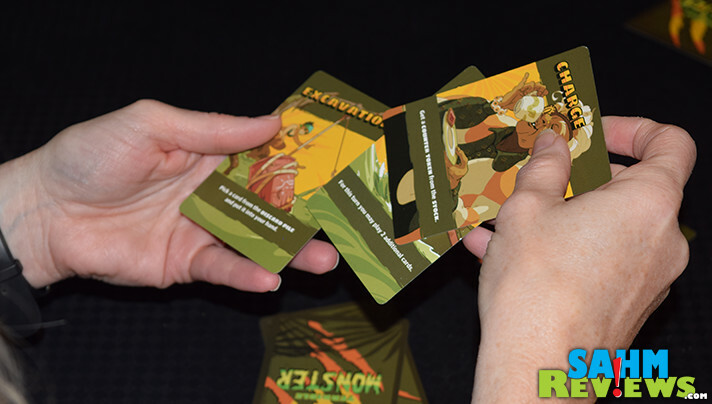 Each cards has its own self-explanatory text that tells you what action to take when playing it. One might have you grabbing a Counter token from the stock while another will allow you to play an extra card on this turn while drawing and discarding additional ones. Only a couple of the sixteen cards actually causes your opponent to lose some of their Life tokens. Those should be played immediately and often in order to gain the upper hand. Combo’ing them with Spell cards that allow you to regain and play them again will put you in the winner’s seat very quickly! 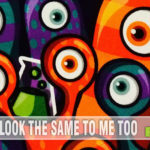 Another example of a game not readily available in the US (yet), you can find copies direct from the publisher for under 10 Euros on their web shop. Find out when Sweet Lemon Publishing will be bringing it stateside by following them on Twitter or Facebook! Have you picked out a game to play on Halloween yet? This sounds like another great game to add to our collection. 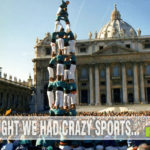 We don’t do trick or treat any more in our home so , playing a few games sounds great for that day! 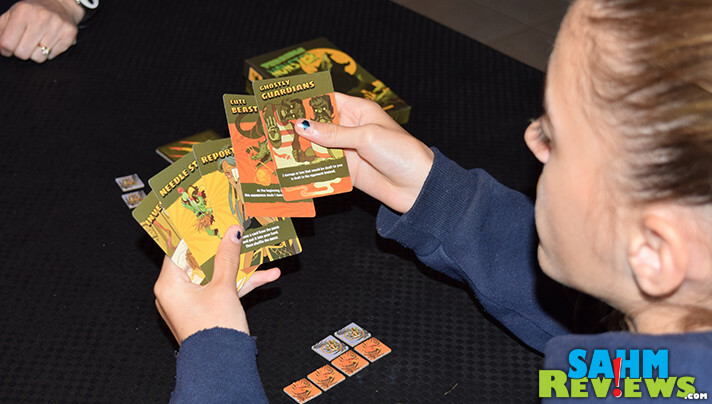 I think the boys would like this one, they have a few Monster card games but most are for more then two players and last forever to play.